The Safety Centre are pleased to announce the introduction of the Channel Safety Systems range of LED Emergency Lighting fittings. This range of fittings includes bulkheads, exit signs, downlights and twinspot units. These fittings have an attractive design and have a lower current consumption than traditional emergency light fittings. For more information on these products call us NOW on 01200 428 410. Below are some of the examples of the LED Emergency Lighting units produced by Channel Safety Systems. The Meteor fitting looks like a traditional 8 watt bulkhead fitting, yet instead of a fluorescent tube it features an array of LEDs. This device offers a current consumption of 25% of that of a traditional bulkhead and boasts an impressive life expectancy of upto 48,000 hours. It has a user selectable maintained or non-maintained operating type and also has a 10% output night-light facility. 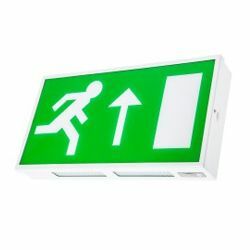 The Dale fitting is a boxed exit sign that features a self-test facility. This facility means that maintenance costs can be reduced as it removes the need for periodic testing from electrical contractors. 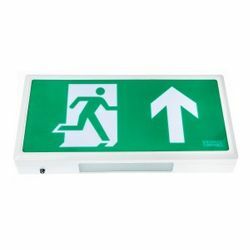 The Dale LED Exit Sign Emergency Lighting fitting has a 32 metre viewing distance and has various pictograms available depending on the direction of the escape route. 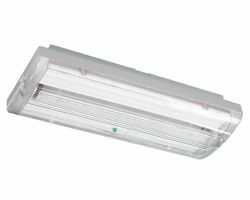 If you’re interested in this range of equipment you may also be interested in our LED Bulkhead Emergency Light and LED Exit Sign Emergency Light fitting ranges.